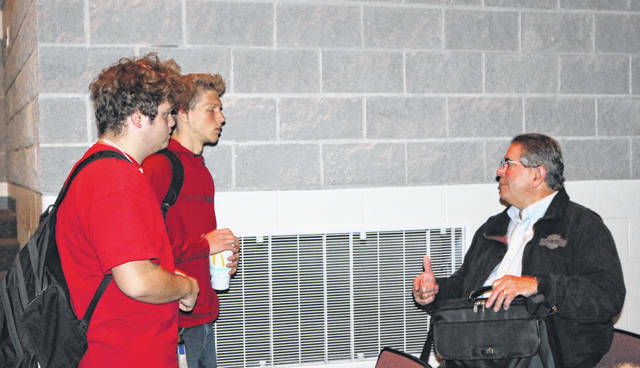 Indian Lake seniors Noah Reynolds and Devin Haver speak with Paul Benedetti after his presentation at the high school. The US 33 Smart Mobility Corridor may already be changing the direction of life after graduation for some Indian Lake High School students. For the second time this fall, representatives from the Logan County Area Chamber of Commerce presented information at Indian Lake Schools on what’s called the Smart Corridor now under construction in southeastern Logan County. In his presentation to students, Logan County Chamber President Paul Benedetti explained the immediate and future career opportunities related to autonomous vehicles that will accompany the massive project and the anticipated growth to the community. Many students took his words to heart right away. After hearing a similar presentation during the Indian Lake Schools Staff Professional Development Day at the end of October, ILHS Principal Kyle Wagner knew he wanted to expose ILHS students to Benedetti’s message as soon as possible. Benedetti also briefed the students on the hi-speed fiber that is now connecting the Transportation Research Center near East Liberty to Columbus, and points in between. He explained that in 2019, driverless vehicles equipped with sensors will be on the highway sending information to the Ohio Department of Transportation on highway conditions, to the Ohio Highway Patrol for traffic information and to private companies to develop further smart automobile technology. He says local companies need engineers and builders who can work together to develop further technology, not to mention young people to program the technology involved. In addition, Benedetti says we need construction workers and trades people to build additional housing. He encourages students to visit https://www.33smartcorridor.com to learn more.